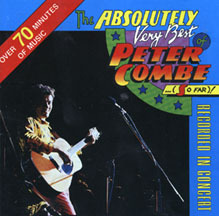 The Absolutely Very Best Of Peter Combe (So Far) was recorded before a live audience in the Adelaide ABC studios. It was released through ABC music in 1990 and received a Gold Album award in December of 1991. In 1991 it also received the ARIA for 'Best Australian Children's Record'. It was re-released in 2000 through Rascal Records, this time featuring 3 bonus tracks.